George Robert Mitchell was born in South Petherton in the spring of 1855, the son of carpenter Joseph Mitchell (b1829) and Susan née Stuckey (1828-1915). Joseph and Susan lived in south Wales fro several years before moving back to Somerset as may be seen by the birth places of their nine children; Fanny (b1854, South Petherton), George, Joseph (b1859, Cardiff), Mary (b1860, Cardiff), Elizabeth (b1862, Cardiff), Alfred (b1866, Crewkerne), William (b1867, Crewkerne), Samuel (b1870, Crewkerne) and Thomas (b1872, Crewkerne). In the spring of 1881 George married Mary Elizabeth Slade (b1856) at Crewkerne and they set up home in West Street, Crewkerne and in the census of that year they were listed with Mary's three young sisters. George gave his occupation as a plumber. George and Mary were to have four children; George Robert Jnr (b1883), Eliza E (b1885), Richard Slade (1887-1909) and William P (b1893) - all except William being born in Crewkerne. By the time of the 1891 census George had moved his family to Odcombe. They lived at the Odcombe Inn where George was listed as the inn keeper as well as carrying on his trade as a plumber. The stint as landlord was short lived as by 1893 George had moved his family to 7 South Street, Yeovil, where William was born. By this time George was aged 45 and gave his occupation as a plumber and glazier while George Jnr was and apprentice plumber. Whitby's Yeovil Almanack Advertiser of 1895 and 1898 listed George as a 'Plumber & Glazier of 7 South Street'. However George was to move his family again, this time to 23 Market Street and Whitby's Yeovil Almanack Advertiser of 1903 listed him at this address. 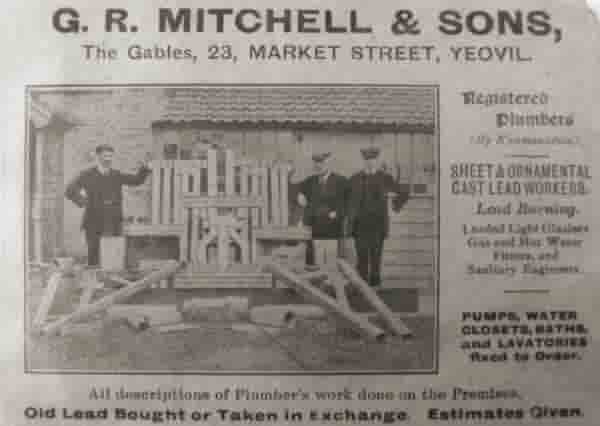 There were three separate entries in Collins' Yeovil Directory of 1907 for this address; firstly just as a plumber, then as 'Gas Fitters, Plumbers, etc' and finally (and somewhat surprisingly) as a 'Saddle & Harness Maker'. William too was to become a plumber and by the 1911 census all three were listed as plumbers of Market Street. The advertisement shown below features George Mitchell with his two sons photographed with the pipes and fittings of their trade. Kelly's Directory of 1919 listed 'George Robert Mitchell & Sons, Plumbers & Glaziers, 23 Market Street'. George Mitchell died in Yeovil in the autumn of 1923 aged 68. Mary died in Yeovil in the summer of 1940 aged 84. After George's death the firm was carried on by his sons and Kelly's Directory of 1935 listed 'George Robert Mitchell & Sons, Plumbers & Glaziers, 23 Market Street' while Edwin Snell's Directory of 1954 listed GR Mitchell & Sons as 'Plumbers & Gas Fitters of Market Street'. 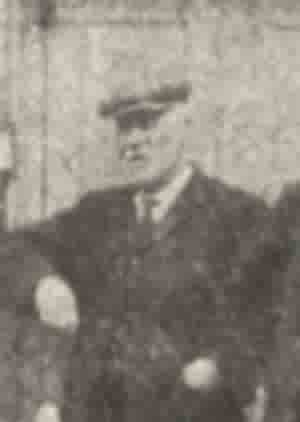 George Mitchell, enlarged from the advertisement below. George Mitchell, posing with his wares, with sons George (left) and William (right) in an advertisement from Whitby's Yeovil Almanack Advertiser.